Rai Rai Kyonshis: Baby Kyonshi no Amida Daibōken (来来キョンシーズ。　ベビーキョンシーのあみだ大冒険, Rai Rai Kyonshis: Baby Kyonshi no Amida Daibōken? 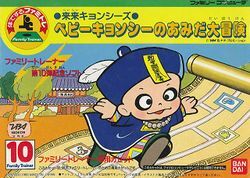 Come come Kyonshi: Baby Kyonshi's Great Ladder Adventure) is a game developed and published by Bandai for the Famicom. It is the tenth and final game published in the Family Trainer series which utilizes the Family Trainer mat, known in the United States as the Power Pad. It is based on a TV show about a young Kyonshi - better known as the Jiang Shi Chinese hopping vampire outside of Japan. The player, as the Kyonshi, must complete various mini-game challenges in order to help it reach its parents. After the player completes one sections, a ladder randomly determines the next mini-game. This page was last edited on 8 May 2017, at 01:05.